This post originally appeared on our sister site, TeacherPensions.org. 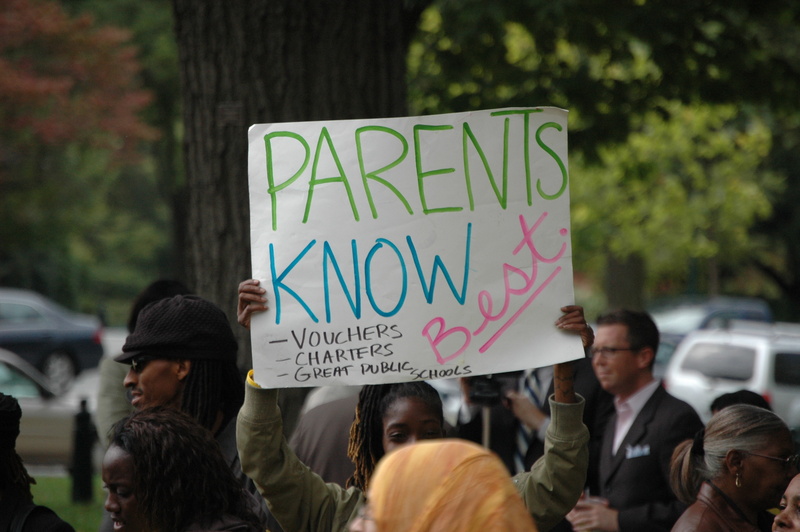 There are strong arguments in favor of letting charter schools opt out. Most charter school teachers would be better off in more portable retirement plans. 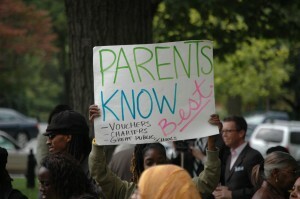 And charter schools tend to be new, so it might be unfair to ask them to pay off the debts of the old system. Still, if charters are allowed to opt out, that puts added pressure on traditional school district budgets as they’re forced to take on proportionately larger shares of state pension legacy costs. 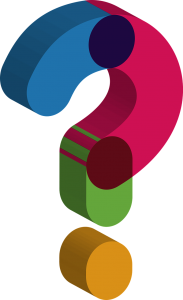 As the charter sector has grown over time, and as pension debts eat up a larger and larger share of school spending, the charter school pension question has been bubbling up. It’s even played a small role in the debate over the nomination of Betsy DeVos to serve as the U.S. Secretary of Education. 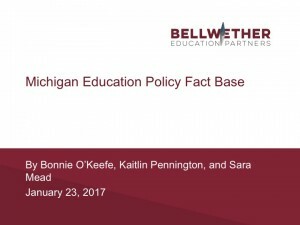 As my colleagues Bonnie O’Keefe, Kaitlin Pennington, and Sara Mead noted earlier this week in their slide deck analyzing the education landscape in Michigan, DeVos’ home state of Michigan has one of the nation’s largest charter sectors, with more than 40 charter school authorizers and 10 percent of its students attending charter schools. Michigan’s charter school sector is also unique in that 71 percent of its charters are run by an Education Management Organization (EMO), which is a for-profit operator of public schools. Although DeVos has been personally maligned for Michigan’s large for-profit charter sector, one thing that’s been missing from the debate is that Michigan’s EMOs are exempt from the state teacher pension fund. That means Michigan’s EMOs get to avoid paying a share of the state’s pension legacy costs, and in the process, they’re playing a small part in exacerbating the pension debt problem for all other Michigan public schools. This entry was posted in Teacher Pensions and tagged Betsy DeVos, DeVosDebate on January 27, 2017 by Chad Aldeman. When President Donald Trump nominated Betsy DeVos to serve as his Secretary of Education, she was not well known on a national scale: her behind-the-scenes advocacy and philanthropic work has concentrated on her home state of Michigan. But DeVos’ nomination put a national spotlight on education in Michigan, and her critics and boosters alike have been making a variety of claims about Michigan that are confusing and contradictory. To address this, Bellwether just released a fact base on education in Michigan to inform the conversation about DeVos’ work there and what it might mean for the Department of Education if she is confirmed. Our slide deck report addresses a number of key questions: How are Michigan students performing, and what do achievement gaps look like for low-income students and students of color? Do charter schools in Michigan produce better results than district-run public schools, and if so, by how much? Why does Michigan have so many charter schools operated by for-profit companies? Michigan typically ranks in the lowest third of states in terms of student proficiency on the National Assessment of Educational Progress (NAEP), and state assessment results show wide achievement gaps by racial/ethnic group and income level. Educational authority in Michigan is highly decentralized, with multiple state governing entities and over 40 charter school authorizers. About 150,000 Michigan students attend public charter schools, making up 10 percent of the student population. Another 200,000 students, or 13 percent, take advantage of inter-district choice options to attend schools outside of their home district. On average, students attending charter schools learn more than comparable students attending district-run schools. However, producing greater learning gains compared to schools serving similar students is a low bar because most Michigan charters are in Detroit, one of the lowest-performing large, urban school districts in the country. Repeated reform efforts to improve Detroit Public Schools (DPS) have not produced academic improvements for students or solved the ongoing financial crisis in the school district. A new law reinstates local control over DPS, limits charter school expansion to nationally accredited authorizers, and creates an A-F accountability system for both charter schools and traditional public schools. Through data analysis and a deeper dive into the context of the Michigan education landscape, we hope to inform the ongoing debate about DeVos and give new insight into education in Michigan. The state has been a laboratory for school choice and educational reform efforts, and demands a more complete context and deeper analysis than sound bytes can provide. Read the full report here and let us know what you think. This entry was posted in Accountability, Charter Schools, Education Policy, School Choice, State Education Policy, Student Assessment, Student Data, Teacher Effectiveness and tagged Betsy DeVos, DeVosDebate, Michigan Education, Secretary of Education on January 24, 2017 by Bonnie O'Keefe and Kaitlin Pennington.